The Skyline of Singapore Like You've Never Seen It Before! The largest port in Southeast Asia, Singapore is like no other place in the world. Once a British colony, the history of this now independent city-state is reflected in its deep cultural diversity and vibrant economy. 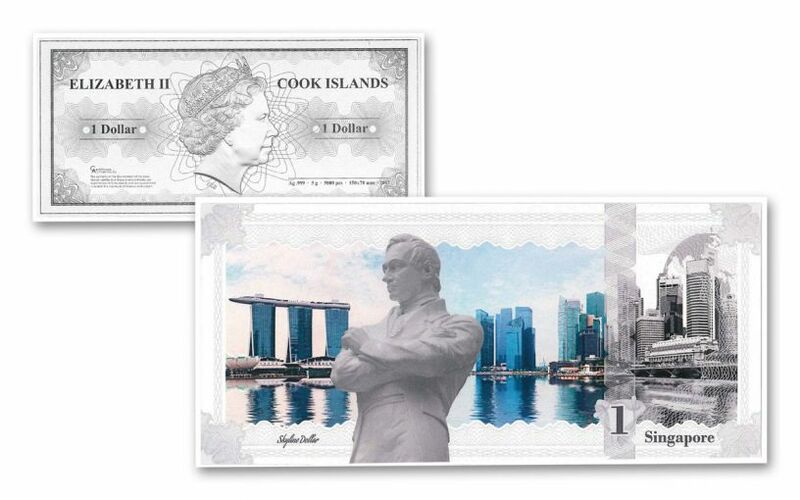 And now, you can bring Singapore's gorgeous skyline home with this first-ever legal-tender silver note -- part of the new "Skyline Dollars" collection! A WORLD FIRST!-- As you can see, this isn't your normal silver dollar! Struck in five grams of highly-pure 99.9% fine silver, each Singapore Skyline Dollar is expertly minted using state-of-the-art technology. The result is the world's first legal tender silver note -- measuring 15x7 centimeters with a thickness of only.045 millimeters. That's less than half the thickness of an average sheet of paper! GLOBAL TREASURES IN VIVID COLOR!-- Advanced colorization techniques bring several of Singapore's icons to beautiful life! The image of founder Sir Stamford Raffles' white polymarble statue at the Singapore River stands tall above a vivid image of Marina Bay. Beginning with the Marina Bay Sands to the left, your eye will travel across this city's gorgeous skyline. INTRICATE DESIGNS IN A PROOF-LIKE FINISH-- Elaborate guilloche patterns compliment both sides of this silver note, struck to a proof-like finish with lustrous fields and sharp details. 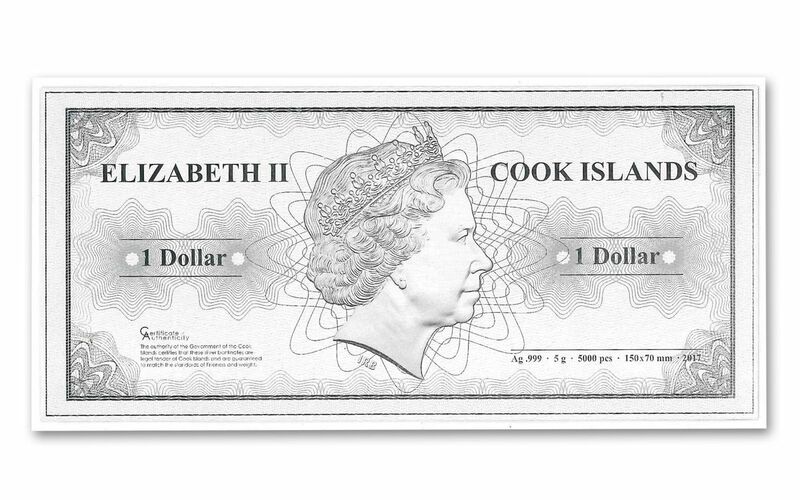 COOK ISLANDS LEGAL TENDER-- As we hinted before, each 2017 Silver Singapore Skyline Dollar is one dollar Cook Islands legal tender, a fact reflected on the note's obverse along with Ian Rank-Broadley's profile of Her Majesty Queen Elizabeth II. AN EXTREMELY LIMITED MINTAGE-- You'll also find the note's weight, silver purity, issue year and size on the obverse, including the fact that this phenomenal note has a limited mintage of 5,000 pieces! PROTECTIVE PACKAGING -- Your Skyline Dollar will come secured in a protective laminate. And the certificate of authenticity? It's incorporated directly into the note's design! Part of an eight-note series, this Singapore Skyline Dollar is both a great collection addition AND a perfect gift for the world traveler in your life. But don't wait too long -- this note's premier status and limited mintage make it one attractive sight! 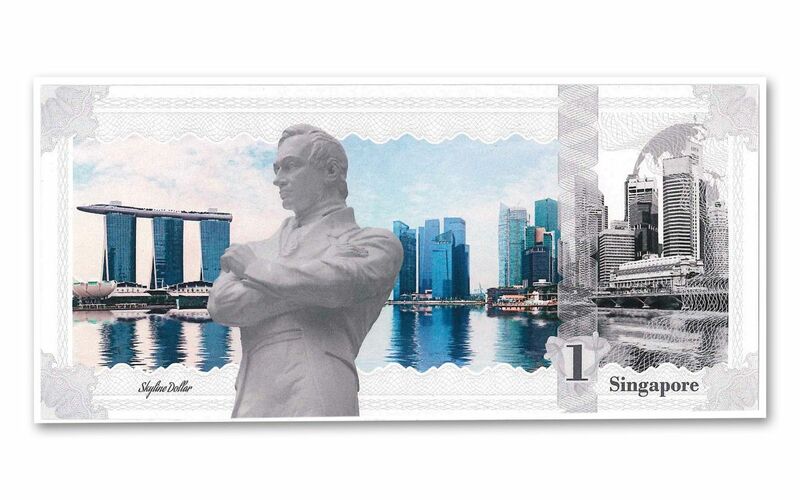 Update your itinerary and order your own Singapore Skyline Dollar today!